Captured all 4 Aged Yeti’s… Now what? Any stout lover surely has tried the regular Great Divide Yeti as I have, but I have not yet tried ANY of the Barrel Aged Yeti’s. I managed to somehow round up all four of these supposed mythical Sasquatch beers. Had to travel to places way outside of Pennsylvania to find these beasts. Now the question is, how to drink them? Obviously I can’t drink all of these myself in one night, but would you do all 4 in one night with a few friends? One a night for four nights? If so in what order? Try the regular yeti first then move on up? What would you do if you had all four? Give me some feedback in the comments below people! 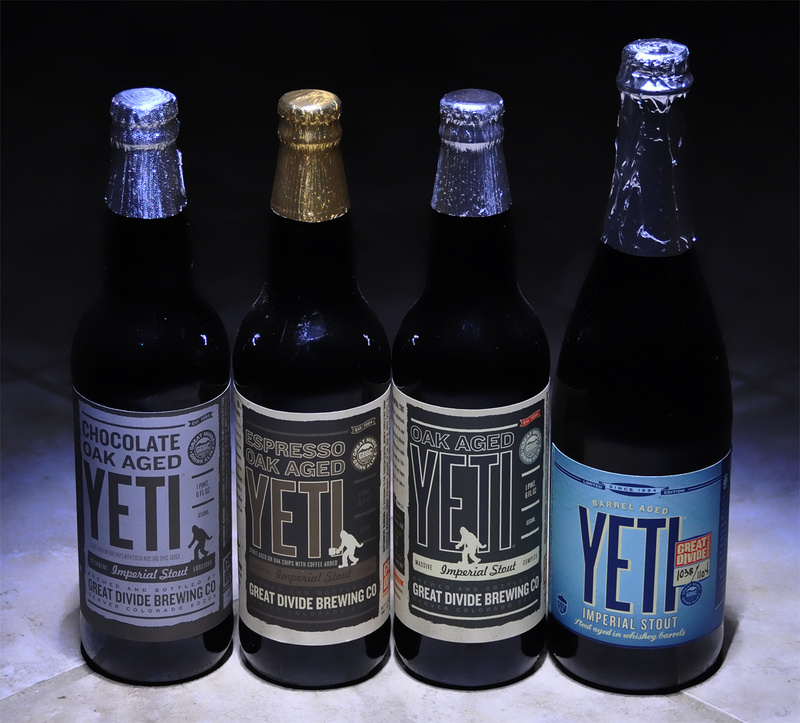 Sidenote, Does anyone know what the 2005 vs 2009 label looks like for the chocolate yeti? Jared from BA bought this for me and told me the guy at the store claimed it was an 05, but the 5 can kind of looks like a 9 to me.. What do you think? 2 Days, 7 brewpubs, 1000+ miles, and still not enough beer! Ok so I am warning everyone ahead of time this might be the longest beer post ever. If you dare click “more…” below to read what went down on my beer marathon; complete with pictures. Random Post – Happy New Year and Who Are You?! So overall I am very surprised to the response I have been getting to this blog. At first I was apprehensive about doing this but am glad I did. I am averaging over 100 views a day, but the question is… Who are you? where are you from, how did you find my blog, and what would you like to see me do differently in 2010 with my site? I want to hear your feedback. Don’t be bashful to post your thoughts in the comments section as I read and reply to every single one. And if you haven’t yet, click the subscription button on the right column of the page to get daily updated sent to your email. Personally I am starting off 2010 by doing a little brewery tour with the girlfriend. I know most of the breweries might be closed today, but I am getting a little bit of cabin fever. Going to start off by heading to NW PA towards Erie, then through northern Ohio, and into southern Michigan. If we have time we might try to end the trip in Chicago at Goose Island. Below is a list in order of what we will be passing, I know we wont be able to get them all but I’m going to try! I purchased most of this beer from Vintage Estate, and let me start off by saying it is a beer lovers MECCA. The owner (Phil) and staff (Bob and others) are unbelievably friendly and helpful. This place is only about a 45 minute drive for me, but I would probably drive up to 3 hours to stock up. This place is THAT good. They have almost 700 different FRESH and some hard to find bottles, all at prices that are just amazing. Most of the beers are under $2. They also have a ton of wine, and carry about a dozen different types of meads. Meads are fermented just like beer, but with honey. If you live anywhere even close to Boardman Ohio, you must go here. You can easily make a day of it. The other bottles I purchased from 3 Sons dogs and suds in Wexford, PA. In my opinion its probably the best 6 pack shop in Pittsburgh, but unfortunately their prices and selection cannot compete with Vintage. This is mostly because PA Beer laws are almost criminal. They tax the crap out of beer and make it pretty hard for anyone to run a real bottleshop around here. The guy who runs the shop is a little bit cranky at first, but he will warm up to you once he gets to know you. Anyways onto the beer. Why is it that breweries stop releasing their seasonal beers way too early in the “season.” I wanted to pick up a bunch of winter warmers and Christmas beers but they are sold out almost EVERYWHERE. Regardless I made some pretty decent pickups. 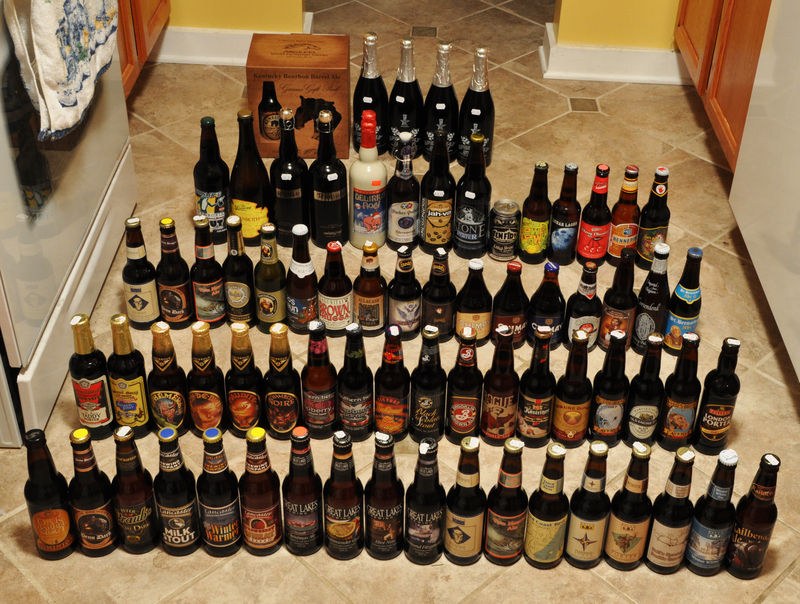 The front row will be sent off next week on a trade, but the rest I will be drinking over the next couple months. Unibroue Terrible, Delirium Noel, some Speedway Stout to age for awhile, etc etc. See a beer you recognize and have a dislike/like for it? Let me know in the comments section below.